Zumba on the beach in Cuba with Isabel - Zumbeando! ZUMBA Beach Party in Cuba~TIME TO BOOK YOUR TICKET! Departing April 4 from Toronto for 7 or 14 nights on the beach in Cuba! This is an all-inclusive resort package, covering accommodation, food, beverages, flight (Toronto to/from Cuba) & taxes--no hidden fees. From $658 per person + $65 for your week of daily ZUMBA® classes with Isabel. Seats are limited, so don't delay. Booking deadline is January 31, 2013. For more information on how to book your ZUMBA® vacation in Cuba with Isabel, visit jennicacuba.com. ZUMBA Beach Party in Cuba~with Isabel! The date is set for you to join Isabel in Cuba for her ZUMBA Beach Party. Mark your calendars: April 4 to 11, 2013. You know how much you love moving to Isabel’s ZUMBA® Fitness classes in Victoria, right? Imagine how it will feel to wake up on a tropical beach at an all-inclusive resort doing ZUMBA® Fitness with Isabel every day! Isabel's friends know that she’s a very proud Cuban. Now you have the opportunity to zumbeando on the beach with Isabel in her native country. Click on the image to the left to download a copy (PDF) of the poster and share it with all your ZUMBA friends. Everyone is welcome, so be sure to invite spouses, family and friends to join you even if they don't want to participate in Isabel's daily ZUMBA classes. There’s an amazing place in southeastern Cuba, which is the warmer Caribbean part of the island. It’s the all-inclusive Club Amigo beach resort in Marea del Portillo (http://sunwing.ca/HotelDesc/En/MZOCAM.asp). Marea is a hidden gem surrounded by the rural and romantic landscape of the Sierra Maestra mountains where the Castro brothers and Che Guevara mounted the revolution back in the 1950s. Clear tranquil waters, a long sandy bay, nearby lagoons, white shell islands, and the surrounding hills that capture the glow of sunrises and sunsets—these are the scenic qualities that captivate the few tourists who have the rare opportunity to visit this part of Cuba. And that’s only what you see at first glance in this exotic place that’s full of local charm. Club Amigo Marea del Portillo serves one commercial tour operator, Sunwing, a Canadian company that has been chartering snowbirds for years. One of these snowbirds is Jenny Cressman from Ontario. Ever since her first visit in 2009, she’s been enchanted with Marea. A couple times a year, she organizes groups of friends and like-minded travellers for holiday retreats at the resort. Working closely with Sunwing, she obtains the best group rates available and passes on the savings to people who book through her. Jenny is a capable and trustworthy organizer, not a paid travel agent or guide. She volunteers her time to organize groups for the love of introducing Canadians to the charming people of Marea and other villages. She’s led by compassion to alleviate challenging social and economic conditions in farming communities nearby the resort. Simple technology—like bicycles—mean that farmers get produce to market, and workers spend less time getting to and from work. Read more about Jenny and her projects by visiting her website: www.JennicaCuba.com. Jenny and Isabel have teamed up to offer an affordable and memorable ZUMBA® beach party. Isabel is excited about welcoming you to Cuba, and promoting her fun and energizing approach to fitness. While introducing you to Cuban-inspired rhythms and dance steps, she will get your body moving and your heart laughing. Jenny has other optional activities in store for you and any family/ friends who would like to accompany you to Cuba without participating in ZUMBA fitness. Everyone is invited! As a licensed ZUMBA® Fitness instructor, Isabel will put together a daily program according to the interests and fitness level of students. Options include regular ZUMBA to ZUMBA Gold; Aqua ZUMBA and ZUMBA Toning; ZUMBA on the beach and ZUMBA by the pool. It’s going to be a ZUMBA beach party—what they call a “fiesta” in Cuba! To ensure you receive the most up-to-date information in the coming months, contact Jenny Cressman at jennicacuba@gmail.com. 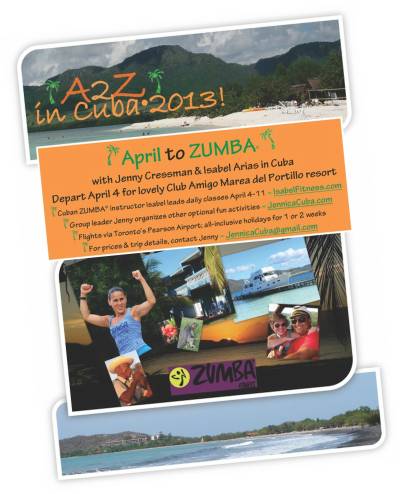 Jenny will keep you informed about everything you need to do reserve your seat on the ZUMBA jet to Cuba in April 2013! ZUMBA on the beach in Cuba?! Where?